Australian Perth Mint Gold. Gold Bars & Rounds. Perth Mint Gold Bars. America the Beautiful Coins. 90% & 40% US Silver Coins. Australian Perth Mint Silver. Cast & Hand Poured. First introduced in 2006, this series was instantly a huge success, providing competition for other gold coins on the market. This beautiful coin is popular worldwide and is highly recognizable with its well-known Buffalo Nickel design. 9999 fine gold with a weight of 1 troy ounce. Struck by the US Mint. Individual coins come in plastic flips. Lot of 20 comes in mint-issued plastic tubes. 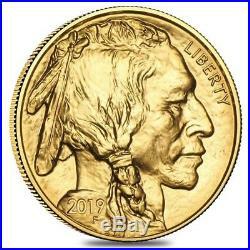 Obverse: Features the profile portrait of a Native American designed by James Earle Fraser. The motto “LIBERTY” is inscribed on the top right. The year of mintage and Fraser’s initial, “F”, is inscribed on the portrait’s shoulder. Reverse: Depicts the iconic image of the American Bison, Black Diamond. Inscriptions of the country name, content, weight, and purity as well as “IN GOD WE TRUST” and “E PLURIBUS UNUM”. Bullion Exchanges offers you a wide selection of exclusive items from renowned international refineries. Add this brilliant coin to your collection today, and it will be carefully packaged and delivered to your address. By purchasing from Bullion Exchanges, you are agreeing to all of our Terms and Policies. Bullion Exchanges reserves the right to refuse or cancel any order reviewed by our Compliance Team, which are deemed questionable or have increasing potential risk for being fraudulent. All customers are subject to a review at our own discretion, in which additional information, identification and/or documentation, may be requested. A prompt response would help expedite the fulfillment of your order. Packages are no longer insured if the tracking information shows the package is delivered. We will only be liable to cover packages that are lost in transit or damaged. There are no exceptions to this policy. Once an order is placed, it cannot be modified or cancelled. Using high definition digital video, we record the packing of our products to affirm accuracy. Bullion Exchanges reserves the right to refuse or cancel any order reviewed by our Compliance Team, which are deemed questionable or have potential risk for being fraudulent. There are no exceptions. The submission of an order and subsequent receipt of a confirmation locks in your order and affects our metal hedging requirements and thus we are unable to make any price adjustments. Our in-house numismatist staff assign conditions to all products. The condition assigned to the products is derived from industry-wide standards. Please keep in mind that most images are stock images, and therefore you should not expect to receive the pictured products. Silver products, and some gold as well, may exhibit milk spots, and/or toning, which are normal and do not change the condition described in the listing, nor the value of the product. Coins that are holdered by one of the major grading companies are graded based on the condition they were in at the time of grading. However, at times, coins do tend to develop spotting or toning which are a normal happenstance in coins. Please keep in mind, the appearance of the toning and/or milk spots does not mean that the coin is not the grade specified on the actual slab. In instances where there is a discrepancy where the customer believes to be unjust, please refer to the grading companys guarantee policy. Both NGC and PCGS have a program where they will compensate the owner of the current coin if they believe the coin deserves a lower grade than it had originally received. Please note, bullion coins, bars and rounds are mass-produced and are not struck to the same quality standards as collector coins. These bullion products are not certified and therefore will not always be 100% perfect. All sales are final and therefore in cases when a product is offered on a Deal Price, previously locked-in orders for that product will not be subject to price reductions or cancellations. Bullion Exchanges reserves the right to cancel sales that may or may not have typography issues within the listings, pricing inaccuracies, systematic faults by our system, and/or errors caused by eBays system, without further notice. Purchasing bullion and/or coins involves price risk, and the purchaser assumes all such risk. We do not offer or make price adjustments based on the market fluctuations of precious metals, or for any other reason. We will never ask the customer to pay more for a product if the price significantly increased, so please refrain from requesting price adjustments after market prices decrease. 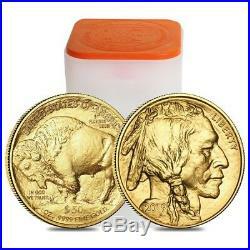 The item “2019 1 oz Gold American Buffalo $50 Coin BU” is in sale since Thursday, January 10, 2019. This item is in the category “Coins & Paper Money\Bullion\Gold\Coins”. The seller is “bullion.exchanges” and is located in New York, New York. This item can be shipped to United States. 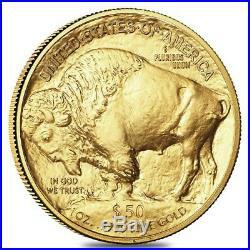 This entry was posted in gold and tagged american, buffalo, coin, gold.